On June 28, 2015, the Adult Sunday School Class reviewed Exodus 26, which describes the structure of the tabernacle. The chapter begins by the LORD telling Moses how the tabernacle curtains were to be designed. The ceiling and walls were to be covered by linen curtains made with colored yarn and cherubim designs. A priest entering the tabernacle would see cherubim depictions on all the walls and the ceiling as a portrayal of heaven. This curtain would then be covered by three more curtains of goats’ hair, rams’ skins, and porpoise skins. Then the upright frames were described which were to form the north, south, and west walls. The frames were to be made of acacia wood and overlaid with gold. The frames would be 15 feet tall and number 20 for each of the north and south walls making a total length of 45 feet for the tabernacle. A total of 8 frames would comprise the west end. The inside width of the tabernacle would be 15 feet. Each frame would rest on two silver bases each made from a talent of silver (38:27). The 4 pillars for the veil would each rest on a single silver base. Thus, the 48 frames and 4 pillars would require 100 silver bases, each weighing one talent or 75 pounds (7,500 pounds total). The chapter also describes the design of the veil and the entrance screen. Listen to The Structure of the Tabernacle (Exodus 26) at mcopc.org. On Sunday, June 21, 2015, the Adult Sunday School class reviewed the remainder of Exodus 25 regarding the ark of the covenant, the mercy seat, the table for bread, and the lampstand. This chapter mentions cherubim for the first time since Genesis 3, where they were identified as guarding the way to the tree of life. Two psalms identify the LORD as enthroned upon the cherubim: Psalms 80 and 99. Also, there are two scripture references that identify the mercy seat as God’s footstool: Psalm 132:7-8 and 1 Chronicles 28:2. Leviticus 16 describes how the high priest entered the holy of holies on the day of atonement and made blood offerings for the sins of himself and the people. The design of the table for bread is set forth. The use of the table is identified in Leviticus 24:5-9. This states that the priests who replaced the bread weekly ate the replaced bread before the LORD as a symbol of fellowship between the LORD and his people. The bread also reminded of God’s provision for his people. As we read about the table we are reminded that our Lord said “I am the bread of life” in John 6. Listen to “Cherubim, Table for Bread, Golden Lampstand” (Exodus 25:1-22) at mcopc.org. 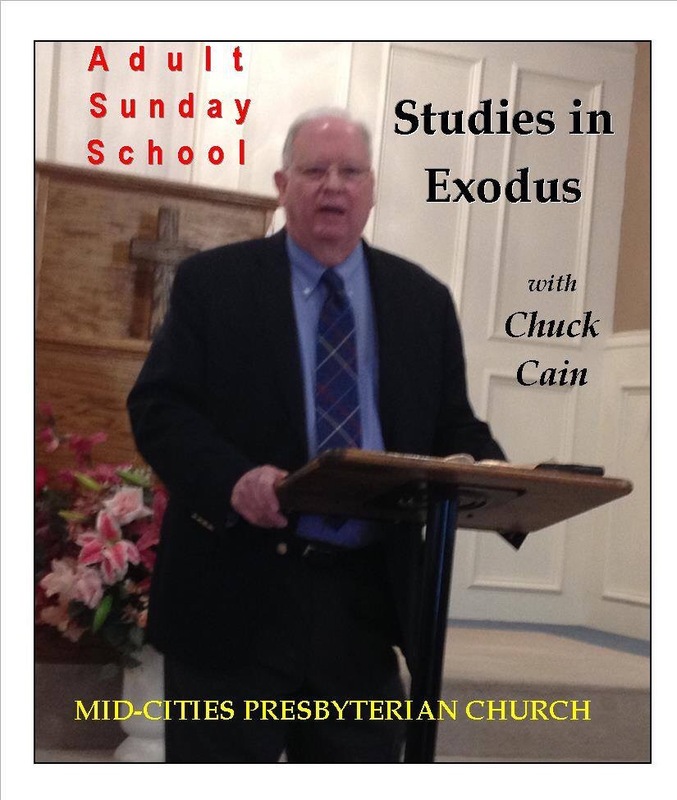 On Sunday, June 14, 2015, the Adult Sunday School class reviewed Exodus 25:1-22 related to the tabernacle. Verses 8-9 are significant because they highlight the two main attributes of the tabernacle. The word “sanctuary” means “holy place” and refers to God’s holiness and transcendence, whereas the word “tabernacle” means “dwelling place” and refers to God’s immanence. Immanence means being within the limits of possible experience or knowledge. God was camping out with his people. Certainly this reminds us of our Lord who tabernacled among us (John 1:14) yet was transcendent in holiness. One class member rightly pointed out that our sin stands between God’s transcendence and his immanence. The remainder of this section describes the design of the ark of the covenant and the mercy seat (atonement cover). The ark also speaks of God’s transcendence and immanence. In verse 22 God tells Moses that he will meet with him there, between the two cherubim. Thus God will be immanent. But in Numbers 4 God instructs that the ark is to be touched or seen by no one except the high priest on the annual Day of Atonement. God is transcendent. Listen to “The Tabernacle, the Ark and the Mercy Seat” (Exodus 25:1-22) at mcopc.org.